The Children Of Hope statue in Galliagh. A new Independent Community Forum is being set up to tackle issues affecting residents living in the Galliagh estate. 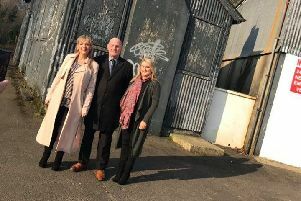 The new body was decided upon at a recent meeting attended by concerned citizens along with several political groups, representatives from local community organisations and Derry City & Strabane District Council’s four Independent Councillors for the Derry area. The meeting was called in response to ongoing issues in Galliagh/ Shantallow area such as anti-social behaviour and the provision of services for young people and more generally for all residents in the area. The Community Forum, which is to include representation from residents as well as interested stakeholders and groups, is asking for input from local people. Their views and opinions will feed into the new body and its agenda, with local clergy, a local school, arts groups, political parties and the Justice Agency among those being invited to take part. A public meeting will be held in St Joseph’s Parish Centre in Galliagh on Thursday, May 14th at 11am and everyone is invited to attend. The forum follows serious bouts of trouble which flared up in parts of the Galliagh estate last month. Residents in some parts expressed shock at youths engaged in brawls, and anti-social activity including children starting fires.